Canonical officially launched Ubuntu 16.04 Xenial Xerus on April 21, 2016. Ubuntu 16.04 is a long-term supported (LTS) version of the popular Linux distribution from Canonical. Long-term supported means Canonical will support Ubuntu 16.04 LTS with critical security patches and software updates for five years, until 2021. 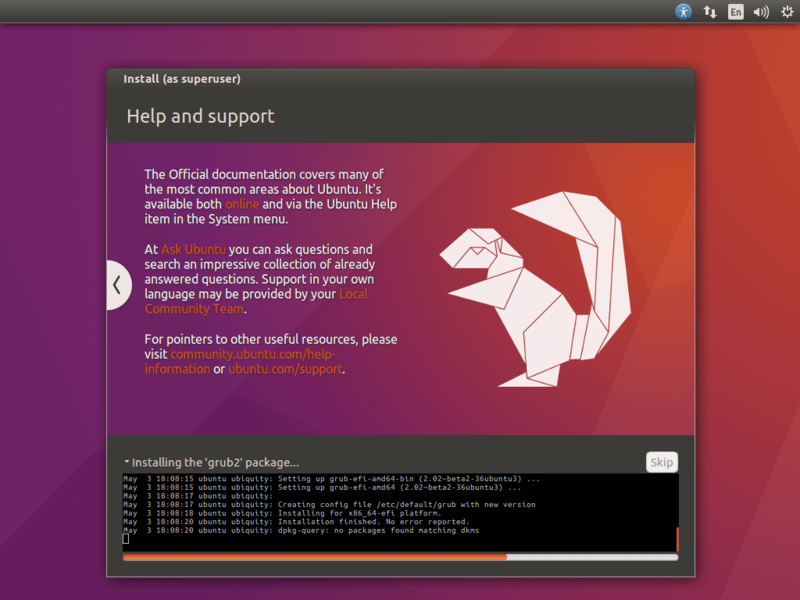 Following this tutorial, anyone, even new Linux users will be able to easily install Ubuntu 16.04 LTS Xenial Xerus on their computers. Before you proceed, please keep in mind, these instructions are for users with a new PC, or for those who do not have any operating system installed on their desktop or laptop, or for those who wants to replace their existing operating system (Windows or Linux) with Ubuntu. If you plan to replace your existing operating system with Ubuntu 16.04 LTS, make sure you have taken a backup of all your important data. Ubuntu 16.04 LTS supports booting on both modern UEFI machines and legacy BIOS machines. You can download Ubuntu 16.04 LTS Live ISO image file from Canonical website. If you have a modern PC, download the 64-bit version otherwise download the 32-bit version. Burn the image on a DVD or make a bootable Live USB disk of Ubuntu by following the instructions here under the section “Easy ways to switch to Ubuntu”. After creating the bootable media, boot from it. The procedure to boot from the DVD or USB drive varies among different computers. Please consult your motherboard, or desktop, or laptop user manual for instructions. 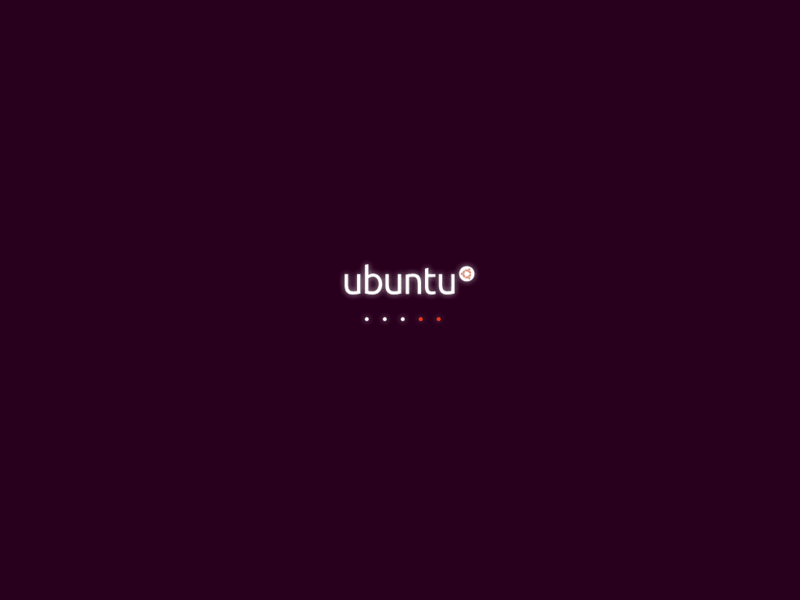 After you boot using the Ubuntu installation media, wait for a few seconds to see the Ubuntu first run screen. 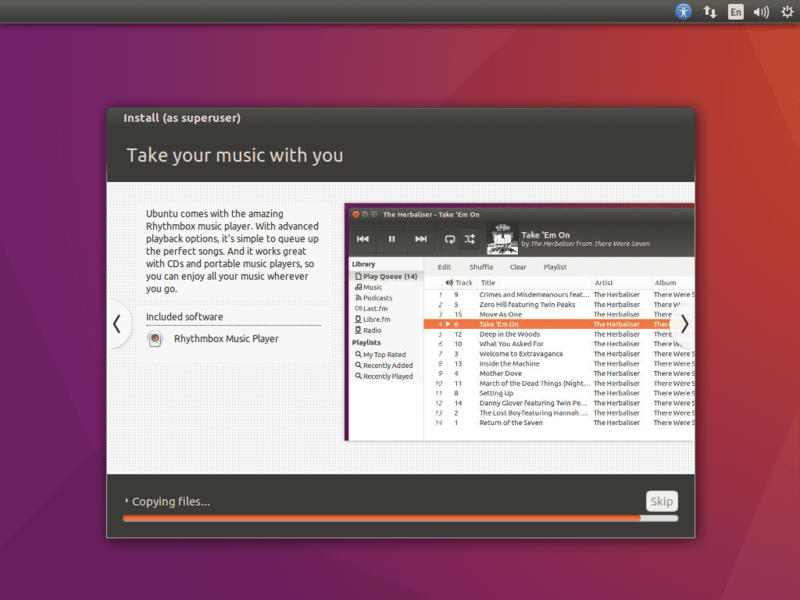 Here, click on the “Install Ubuntu” button. Then, select the language. 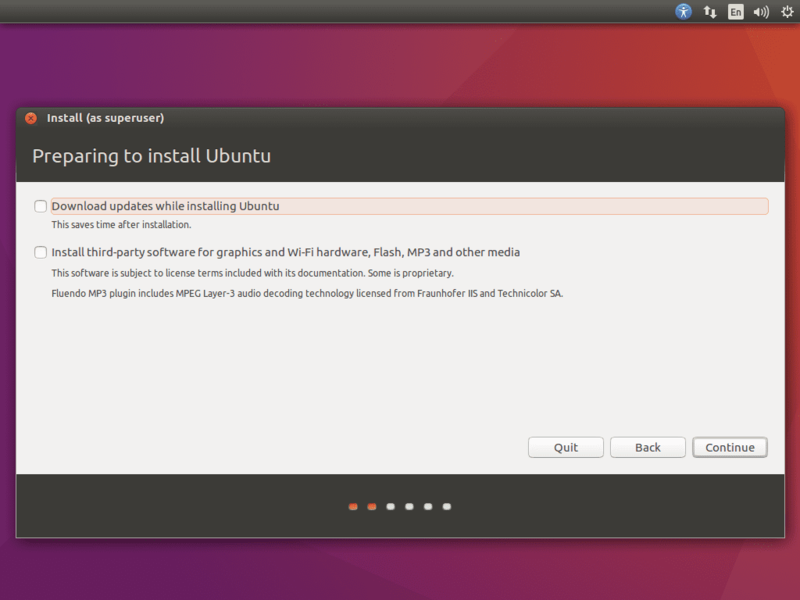 Now, at the “Preparing to install Ubuntu” screen, click on the “Continue” button. 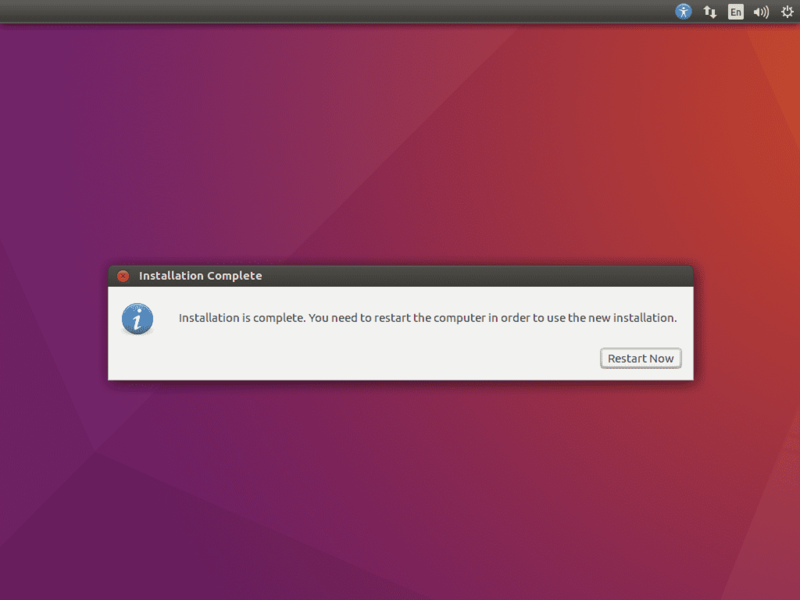 If you choose to “download updates while installing Ubuntu” and “third-party software” during installation, you have to stay online. 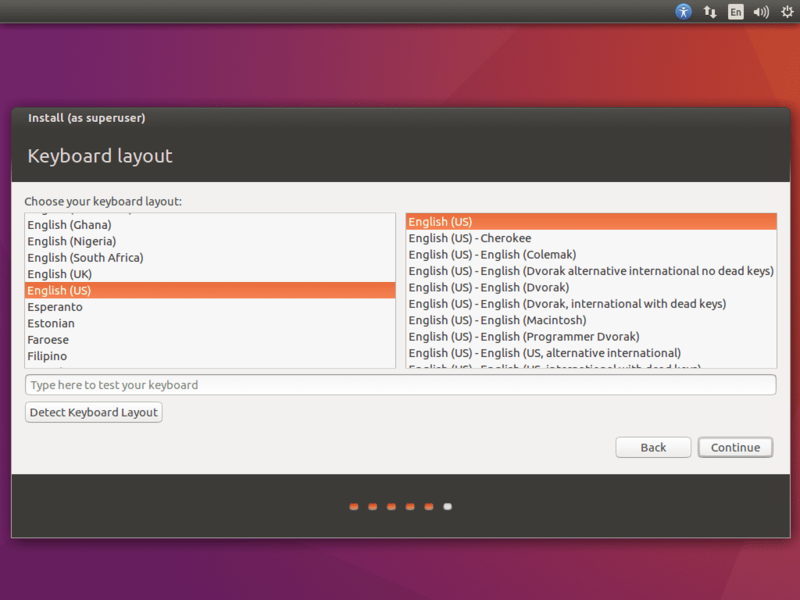 Although if you do not select any of the two, an Internet connection is not required to install Ubuntu. 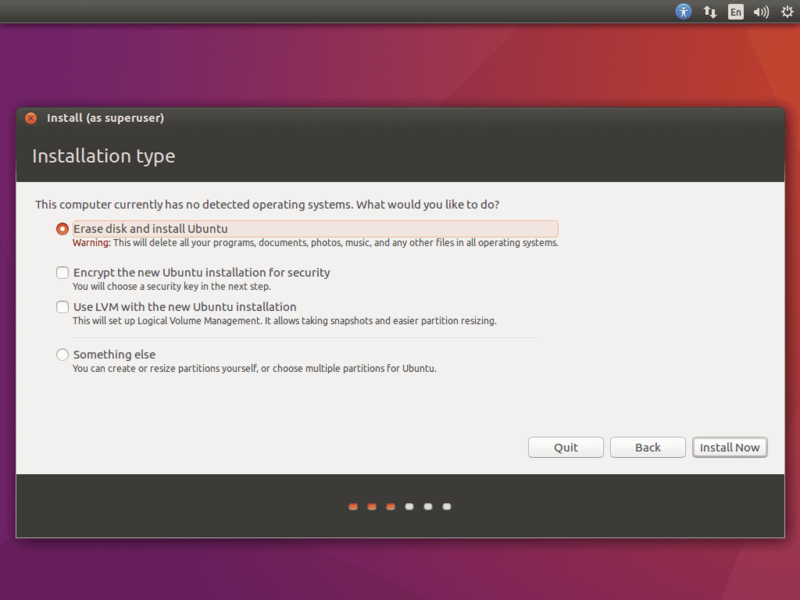 In the next step, Ubuntu 16.04 LTS installer will try to detect if any other operating system is installed or not. Since, in this tutorial we are doing a clean install, we will select the option to “erase disk and install Ubuntu” and go ahead to the next step. If you want more security you have option to encrypt the hard disk and use LVM for partitioning the hard disk. If you choose to secure your Ubuntu installation by encrypting it, on the next step you will be asked to give a security key, basically a password. You need this password every time you start the computer during booting. If you lose the password or forget it, you will lose all your data. So, remember the password and keep a print of the password at a safe place. After inserting the password, you will be prompted to write the changes to the disk. After you click continue here, there is no going back. 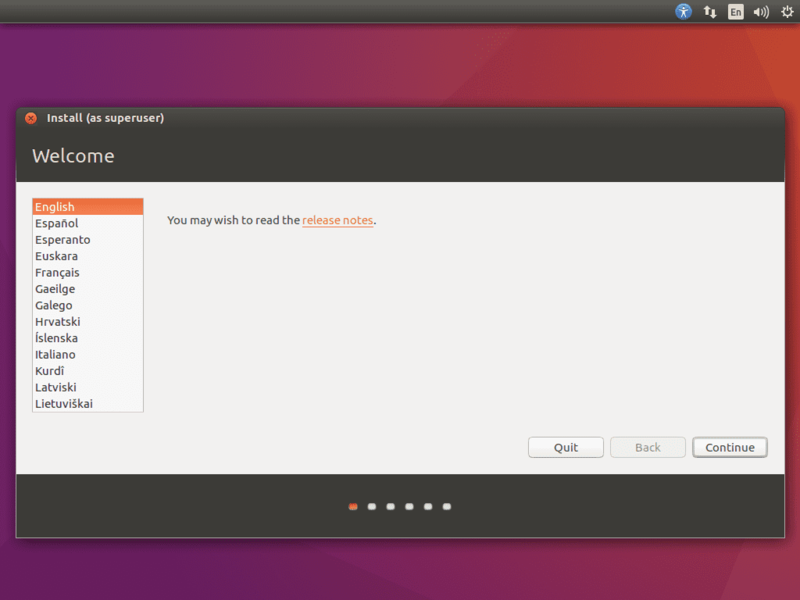 The hard disk will be erased and ready to install Ubuntu. So, if you want to change anything or cancel the installation, click on Go back. Now, the installer will ask you to select your current location, choose a keyboard layout, create a user. You have the option to encrypt the Home folder of the user here. You can also choose your preferred login method (automatic or manual), and add an avatar. Wait for the installation to finish, and press the “Restart Now” button when prompted. The time to complete the entire installation process depends on your computer’s specifications and the speed of your Internet connection. Once the installation is complete, during the reboot process do not forget to remove the USB flash drive or eject the DVD disc, as suggested. Otherwise, you may rerun the installation process without knowing. If you choose to encrypt your Ubuntu installation, you will be asked to give the security key before the operating system boots. Your computer will boot into Ubuntu 16.04 LTS operating system, and you should see the login screen. Enter the username and password you created during the installation to login. While creating the user, if you choose to encrypt the Home folder, upon login, you will get the following window. Click on “Run this action now” and write your encryption passphrase. Keep this passphrase at a safe place to recover your data. You are now in the Ubuntu 16.04 LTS Xenial Xerus universe, enjoy it! If you face any issues during installation, write a comment below. Do not forget to share this with your friends! Let them experience Ubuntu 16.04 themselves!